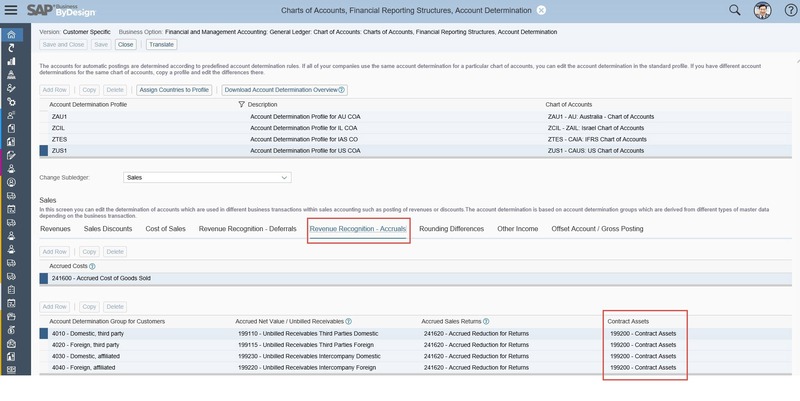 SAP is introducing enhancements to SAP Business ByDesign to allow customers to comply with Accounting Standard IFRS15/ASC606 Revenue Recognitions Requirements. The series of case documents introduces the key requirements of IFRS15 /ASC606 along with steps to be taken by the client to implement the new functionality. Meeting the IFRS15/ASC606 requirements requires a thorough investigation of how current sales processes and subsequent fulfillment processes are affected by the standard. It is far more than a revenue accounting routine in financial accounting and will require input from the sales department, revenue accounting specialists, and auditors. How to deal with performance obligations in a fixed price scenario? What are ‘fair’ market oriented standalone selling prices? How should performance obligations be applied? What is regarded as a ‘contract’? Are time and material based accrual methods still justified? It is critical that the affected entities have clearly defined business process that has been agreed upon by all relevant stakeholders (including Auditor) and documented prior to any system activation activities. SAP Business ByDesign behavior as of enhancement activation date. The updated system functionality for IFRS15/ASC606 will not apply to started or partially fulfilled sales orders, sales contracts, or customer projects in the SAP Business ByDesign system. Instead, the revenue recognition will be calculated as stipulated when the documents were created. Customers need to agree with their auditors how to handle and treat these ‘sales processes in transition phase’ from a financial accounting perspective. We strongly recommend that the set of changes and settings along with business process adaptations is verified in a test environment. For all scoping and fine-tuning related activities the best practice is to use change projects and transport them on the go-live date to the productive environment. Please consider fine-tuning activities that need to be repeated in the productive tenant. The obvious set of aspects that need to be checked and reviewed are highlighted below. Create a change project in your productive system and transfer it to your test system. Activate the scoping option (“Do you want to enable Revenue Accounting Contracts?”). Prerequisite: Revenue Recognition is scoped as well (“Do you want to use solution-supported revenue recognition for sales orders?”). In the Fine-Tuning activity for set of books, activate it (see below). Prepare the test of changed business processes, inclusively adaptation of price and discount lists for the standalone selling price derivation. Discuss results with your auditor to confirm compliance with the new requirements for your business. Execute tests for all business processes. Train your staff on changed business processes. Review the price lists and customer conditions that will be required for the standalone selling price derivation. Change price and discount list if necessary with a validity start date that matches the future Go-Live of the customer IFRS15/ASC606 activation. Merge back your change project from the test system to your productive system. Complete and close the implementation project. 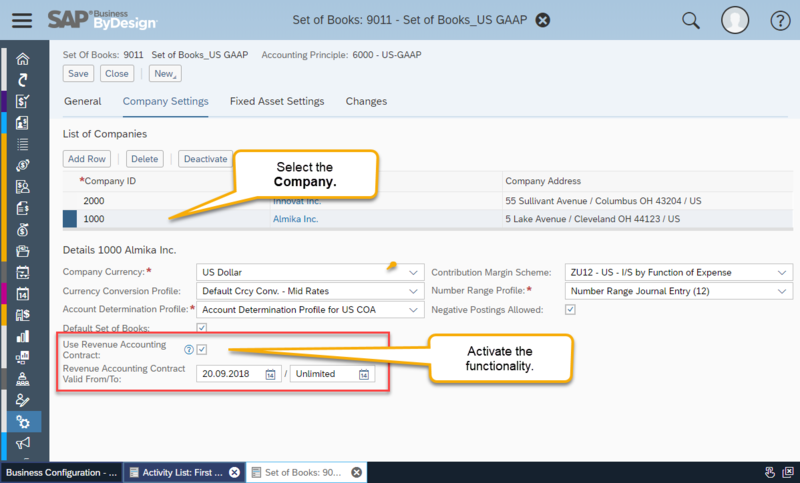 Activate revenue accounting contracts per set of books and company. Review first transactions in the system for correctness to ensure all identified changes are working well and that the new procedures are executed by your work force. Check with newly created sales orders and customer contracts before releasing them that the revenue accounting contracts and performance obligation assignments are done correctly. Check that the derived or manually adjusted standalone selling prices meet the defined criteria. Check that the defined and specified accrual methods are set correctly in the sales order items. The shown steps happen in the SAP Business ByDesign in the fine-tuning activities. Identify the affected chart of accounts that are used in companies and set of books reporting to US-GAAP or IFRS, or other accounting principles leaned to IFRS. The IFRS15/ASC606 standard requires to account for Contract Assets and Contract Liabilities depending on the state of the contract. Therefore, SAP Business By Design account determination rules have been enhanced as shown below. If the derived standalone price for some reason does not represent the ‘fair price’, the financial accountant can manually change the SSP. The manually edited SSP will take precedence on the derived SSP and will trigger a new calculation of the entire revenue accounting contract allocation basis. This action is possible in work center Cost & Revenue, view Sales Documents. SAP Business ByDesign has foreseen 3 approaches of deriving/setting a standalone selling price for different types of businesses. The sales representative adjusts the derived prices using discounts on item and header level. The assumption is that the derived prices initially represent the fair value and are the basis for the standalone selling price. In the case of highly negotiated and customer tailored offerings that vary significantly in size and volume, the assumption is that the derivation of pricelists is of limited use. Most likely the pricelists recommend placeholder prices that are then updated before releasing the order. Such a scenario is typical for customer projects or fixed price projects that highly depend on the project scope. Therefore SAP Business ByDesign envisions the sales representative will enter the transaction price into the sales order representing the invoicing part of the project. a financial accountant can consciously and individually assess an SSP according standards and enter the values in a dedicated work center for the sales order item being assigned to a revenue accounting contract. For high volume use cases where in the product bundle is decomposed to separate products in the order SAP Business ByDesign envisions that SSP price would be maintained in the standard pricelist and would be derived in the document. To change the customer facing price customer can overwrite the price of these component with help of a Cloud AddOn. If customers want the price to be automatically be overwritten other than SSP price and decides to go with Cloud Studio Addon he will have to implement the AFTER_MODIFY exit of the sales document (eg. contracts, sales order etc) and overwrite the ListPrice. “How to overwrite prices” is documented as part of the Business Object “PriceAndTaxCalculation” along with code snippets. With 1811 also a change of the SSP is possible in Financials directly via PDI. It is recommended that the pricelists and conditions for the affected products, product groups or customers, where pattern 1 or 2 apply, be updated to set the new pricing with the validity key date that matches your intended go-live date for IFRS15/ASC606 in the SAP Business ByDesign system. These changes are to be done in the productive environment prior to the intended go-live since they are not fine-tuning activities. Activate the scoping option “Do you want to enable Revenue Accounting Contracts?”. With this scoping option, the functionality is not yet active for any company. To activate it for a combination of Set of Books and Company, open the activity “Set of Books”. 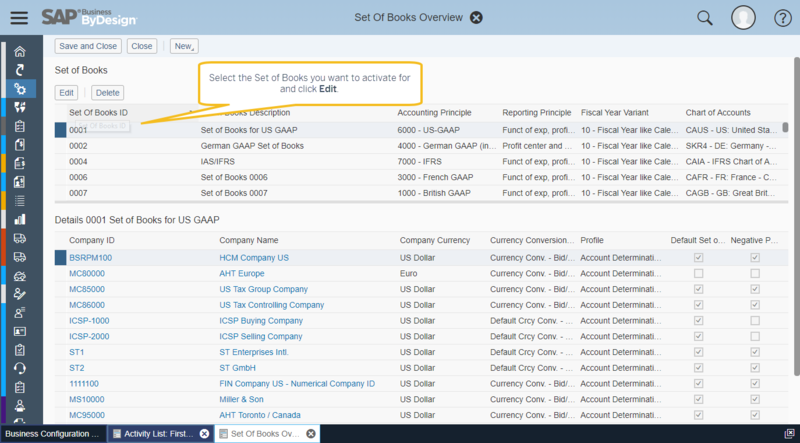 For each Set of Books you want to use Revenue Recognition Contracts, click on Edit. In the Company Settings, and activate the functionality. By default, all sales orders / sales contracts will create a new revenue accounting contract. The sales order and sales contract user interfaces are enhanced by fields to assign a revenue accounting contract and performance obligations on sales document level. Specific revenue accounting contract related reports are activated and visible. The revenue recognition algorithms are taking IFRS15/ASC606 into account for the affected revenue recognition contracts (allocation of revenue between performance obligations, different G/L accounts, determination of G/L accounts at revenue accounting contract header level). After activation, a company might recognize that it is not fully prepared and needs to switch the functionality off. This can be achieved by setting an end date (“valid to”, see above) for each combination of set of books and company. As a consequence, after the valid to date, all sales documents will be realized using classical revenue recognition methods. Until (including at) valid-to date, all sales documents with a revenue accounting contract will be realized using IFRS15 revenue recognition. After valid-to date, all sales documents with a revenue accounting contract will be processed using classical revenue recognition. Contract liabilities and contract assets will disappear from the balance sheet. Sales documents created after valid-to date will be processed with classical revenue recognition only. Assuming the company has prepared it’s preparation, adapted processes, set-up all necessary master-data and is now re-activating the capability, it can do such by setting a new valid-to date (see screenshot above). As a result, all sales documents created after the new valid-from date will have a mandatory revenue accounting contract and processed using the IFRS15 revenue recognition. Sales documents created before the new valid-from date, even if they have a revenue accounting contract from a previous period when this feature has been switched on, will be realized using classical revenue recognition. Sales documents created at or after the new valid-from date will have a mandatory revenue accounting contract and realized using the IFRS15 way. So, it is possible to “pause” the process. SAP Business ByDesign has considered that customers may have the requirement to activate the IFRS15/ASC606 enhancements but still exclude entire sales orders / sales contracts from being handled by revenue recognition. Customer invoice is issued immediately.If these assumptions are correct (the sales order, the items are the contract, the prices match the standalone selling prices and there is no delay between fulfillment and invoice), then no contract assets or contract liabilities need to be considered. Perhaps the reporting entity has not managed to get all business-related prerequisites in place in time. Perhaps there are some sales scenarios where the current limitations of the SAP Business ByDesign enhancements are not suitable. Yet for other business sales processes the SAP Business ByDesign are a good fit and suitable. A transition period should be agreed to with the auditors to ensure that all sales scenarios eventually have system resolutions. There must be a business process outside of the system defined. Create Revenue Accounting Contracts, Sales Orders and Sales Document Items. The standalone selling prices are derived and an allocation basis provided. Leave the Accrual Method “blank”. The system will be forced to define the realization method for COGS and Revenue. Every transaction affecting the sales order item such as time recording, goods issue, goods and service acknowledgement, or return is immediately realized as COGS. Every Customer Invoice is realized immediately as revenue and respective discounts. 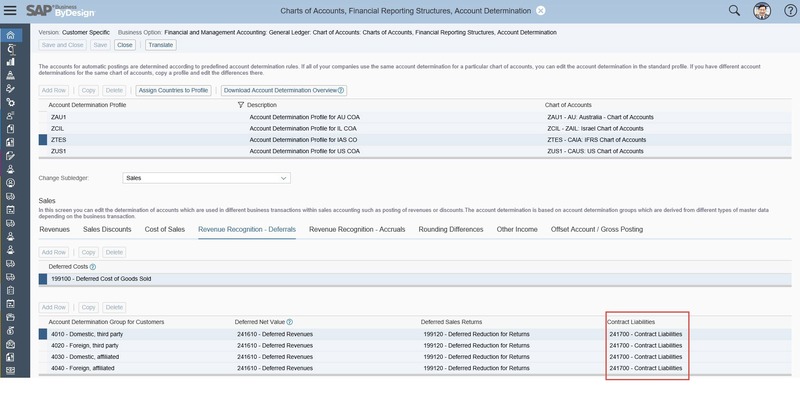 By this defined behavior customers can use recorded transactional data from SAP Business ByDesign and outside of the system to manage the Revenue Recognition. SAP has not implemented dedicated extraction methods for these 2 sources. My customer needs Revenue recognition for ASC 606. How does my customer apply and register for this program? you will be contacted by a colleague on this behalf. Changed – to describe de- and re-activation of IFRS 15 enhancements.